We all know the story of Thanksgiving but here’s a recap. 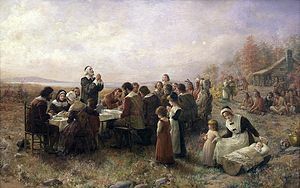 The pilgrims came to the New World after traveling for many days on a ship called the Mayflower. They arrived in November on a spot called Plymouth Rock and were startled to see a ground of rock and sand. Their first winter was hard winter and the Pilgrims suffered through illness and starvation. However, friendly Indians came to visit the Pilgrims. In particular, one named Squanto taught the Pilgrims how to plant corn, wheat and barley. The seasons changed and when autumn came the Pilgrims were so pleased with their first harvest they decided to give thanks. They invited the Indians who were so helpful to them and the holiday Thanksgiving was born. Startups need to apply the spirit of Thanksgiving to help grow its businesses. Creating partnerships is important to a business and should be a key strategy for business development and growth. You need to invite partners to your business to help it grow, extend your brand, and to offer your customers the best solution. I’m a marketing strategist and know how to pull all the marketing tactics together for a fantastic campaign but I need my web design and graphic development, mobile apps, email and social media partners to make it work. And for my small business consulting, I need an HR, finance and technology partners. The important thing to remember is that as an entrepreneur you can do a lot but you are not going to be good at everything. So partner up! 1. Are your skill sets truly complementary? Do you support each other’s weaknesses well? 2. Are your working styles compatible? Importantly, do you enjoy working together? I add to this list to get it in writing! So as we entrepreneurs indulge in our turkey and let our filled stomachs relax us let us also take a moment and think about the partners who can help you have a bountiful feast next year.